After two years of challenging hurricane experiences, Hilton Head Island was ready for Hurricane Florence to arrive. 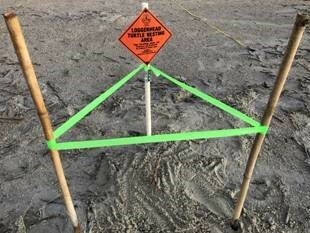 The governor called for a mandatory evacuation, the turtle patrol inventoried as many nests in advance of the hit as possible and the town was mobilized. But then, as often happens, Florence changed direction and we were spared. Not even a heavy rainfall. Although our hearts are sad for the North Carolinians who are continuing to deal with the water and tragedy that Florence left in her wake, we are grateful to be left untouched. When a hurricane comes ashore, it often washes away much of the protective dune sand – including the nests that were laid there. Nature can be so cruel. Luckily, we have lost very few nests this season – and they had nothing to do with Florence. As of today, we have had 179 nests: the 169 nests that were located on the ocean side beaches, eight on the sound side beaches of Mitchelville Beach and Pine Island, and two “wild nests”. Sometimes also called undetected nests, these are discovered when the patrol spots a hatching in a place where there was no nest marked. It is always exciting to find those wild nests!! There are 25 nests still incubating on the beach – more news as the season winds down. 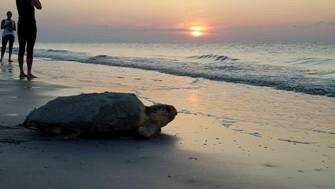 Sea turtles generally finish nesting on Hilton Head Island in early to mid August. Last year, our final nest was laid on August 6th; in 2016 it was August 21st, and the two years before that, the laying season ended August 1st and 2nd. By the way, this same mother tried to nest a little further down the beach this morning, but came ashore and left without nesting there. Here is her false crawl – I guess she was looking for a better spot….. When Mother sea turtle finally settled on her nesting place, she did a great job digging a nice deep nest – but she put it a little too close to the high tide line. Therefore the turtle patrol v-e-r-y carefully removed every egg (96 of them!) and moved the nest to higher ground. and these eggs will reside in this beautiful spot for about 60 days before hatching. Hang in there, hatchlings!! As the hatchlings come out, they make a wild dash to the nearest light (which hopefully is the ocean….#lightsout). And they do all of this without the help of their mother! A mother sea turtle never gets the chance to help her babies – the hatchlings need to make it out of the nest on their own, find their way to the ocean and begin swimming out to sea…..with no help from mom! If you are lucky enough to see happen to see a nest hatch, or the hatchlings running to the sea, enjoy the sight of nature at its most amazing – but do not touch any hatchling or take any nighttime pictures without the proper equipment. The hatchlings are running toward the light of the ocean, and other lights will distract them…..and they have enough challenges to survival already! 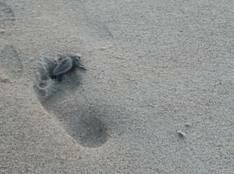 The hatchlings are amazingly tiny – here is a picture of one on a footprint – it barely covers the big toe! It is amazing that they can survive at all! Exactly three days after the hatching, the trained turtle patrol will take inventory of the nest by carefully digging up the remains of the nest, counting how many eggs did not develop, how many eggs are the broken remains of a hatchling, and, once in a while, finding a hatchling or two in the bottom of the nest that needs help getting out. Unfortunately, data is slow coming this year – I will let you know the results of your nest as soon as it is available. 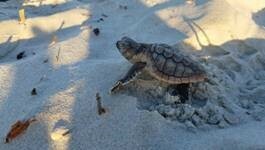 A great summer for sea turtles so far – not many nests but lots of successful hatchings! Here are two nests today just waiting for their time to hatch…..
One of our nest adopters has written a children’s book called “My Walk to the Water: a Mother Sea Turtle Speaks”. In the book, she encourages everyone to help “Put the Beach to Sleep at Night”. Legions of resident volunteer Turtle Trackers of all ages are doing just that – patrolling the beaches of Hilton Head Island in the evenings, from the “toe” of Sea Pines to the “heel” of Port Royal, making sure that the beach is clear of trash and holes….ready and welcoming for the sea turtles. As you may have heard, plastic straws are a huge problem for our wildlife (including sea turtles) and our oceans. The South Carolina Lowcountry is participating in a nationwide effort to reduce the use of plastic straws. Charleston is in its second “Strawless Summer”, and most Hilton Head Island restaurants have embraced the strawfree movement by serving beverages without plastic straws. Making a difference!!! We can all help – wherever we are living or visiting! 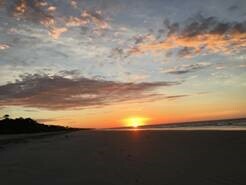 https://www.travelandleisure.com/worlds-best/hilton-head-best-island-in-us We were even mentioned on the Today Show!! And this week, an editor from the magazine came to the island hear the Hilton Head story. She rode along on the morning turtle patrol to see a nest being marked. (She is now the proud adopters of a sea turtle nest!!) Coastal Discovery Museum CEO Rex Garniewicz was interviewed and took the opportunity to talk about our special endangered nesting sea turtles. 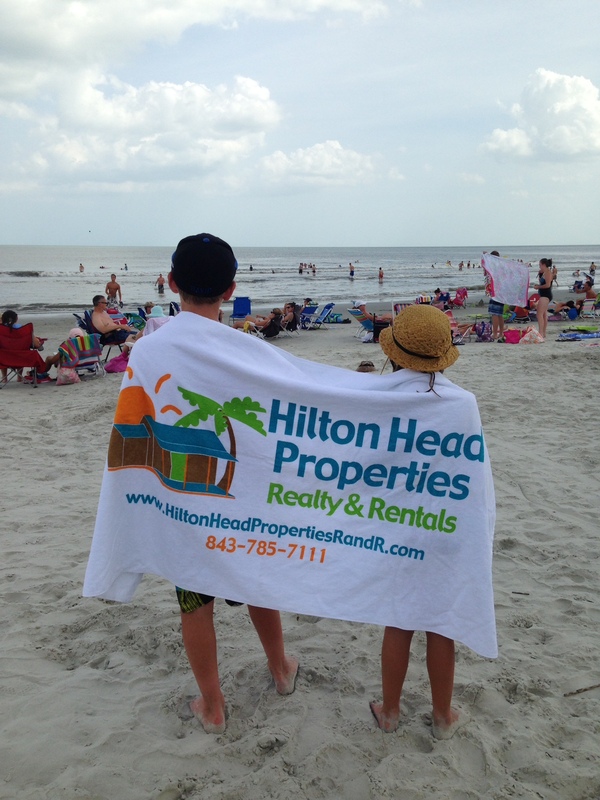 Congratulations, Hilton Head Island!!! This same one even stopped a couple of times to try to nest along the way…. Unless you specified a late season nest, every adopter should have received a nest assignment from me by now – let me know if you have not. Thank you so much for your interest in sea turtles and Hilton Head Island! What a week! The 4th of July brought lots of visitors to Hilton Head Island, and lots of “stuff” to clean up from the beach afterwards. But it was an exciting week for sea turtle fans. First, a mother loggerhead sea turtle become stuck in a hole on Hunting Island, just a little north of Hilton Head Island. This mother tried to nest in an area filled with fallen trees and became lodged in a pit below one of the trees. Volunteers were finally able to free her and she made a beeline back to the ocean. Hooray for the Friends of Hunting Island! 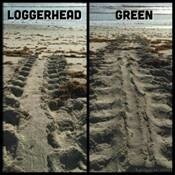 and their nesting area is quite a bit larger than the loggerheads. Up to 124 nests as of this morning –interestingly it is exactly half the number of nests that we had on July 7th of last year – but the volunteers are marking the nests, cleaning up the beach and doing everything possible to make sure that the nests that are on Hilton Head Island are safe, untouched by humans or animals, and protected for the hatchings to come. WOW!! Jayme and Pat of the Sea Turtle Patrol had an awesome day yesterday – 6 new nests AND they got to see this beautiful mother making her way back to the ocean! I will be on patrol on Friday – hoping for another full day of new nests! During the next week, I will be assigning nests to most adopters. (Since there are far fewer nests than usual, there will be some “sharing” of nests……) Remember that if you are on the island and would like to select your nest, please let me know right away – otherwise, I will assign one to you. Thank you so much for all you are doing to spread the word about the sea turtles!! June 11-15, 2018 has been designated as Sea Turtle Week by NOAA (National Oceanic and Atmospheric Administration) – and we are doing all we can to help save this beautiful endangered species from extinction! If you are on the island, even visiting for a short time, you can help! Neighborhood teams have formed to patrol the various beaches in the early evenings to fill in holes, knock down sand castles and pick up trash. Let me know if you are interesting in helping. 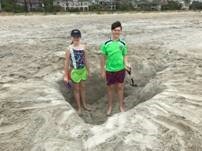 Here is a picture of some more of our helpers filling in a hole. It is an excellent, educational and enjoyable way for young and “young at heart” to spend an hour! The town of Hilton Head Island is also helping in a big way: single use plastic bags will not be used by grocery stores starting October 1st. Turtles think plastic bags are jelly fish (one of their favorite foods (yum!) and eat them (yuk!). Over 100 million marine animals are killed each year due to plastic debris. Buddies? This week a mother sea turtle laid her nest almost directly on top of a nest that was already there…..maybe she wanted her eggs to have friends nearby….. There are now 57 marked sea turtle nests on the beach – still way behind last year on this date (119) and the year before (142), but ahead of our lowest nest year in 2014 when we only had 38 nests by this date. And it is not just Hilton Head – across South Carolina, there are fewer than half as many sea turtle nests compared to the same time last year. The assumption is that the harsh winter depleted the supply of food that the sea turtles eat. A mother sea turtle needs lots of energy to drag herself ashore and lay eggs, so if she does not have enough to eat, she will not make the trip. But, not to worry: we feel confident that the numbers will rebound next year, just as they have in years past.Two reminders: 1) let me know if there is a particular Nest # that you would like to have assigned to you, and 2) if you see a mother sea turtle nesting or hatchlings running to the sea, please do not crowd or touch them or bother them in any way. Just enjoy the sight! Thanks for your helping spreading the word about the sea turtles – every bit of help make a difference!!! Many of you have been asking how you can help the sea turtles on the island – here is your chance!!! As you might have seen in today’s paper, holes and miscellaneous items on the beach are causing quite a problem for our nesting sea turtles and baby hatchlings. A group is forming to organize a patrol of the north end of the beach – between The Folly and The Westin. A few local couples were doing it last year but more help is needed!!! Patrols will be taking place in the late afternoon or early evening; the main purpose will be to fill in holes, knock down sand castles, pick up trash, etc. 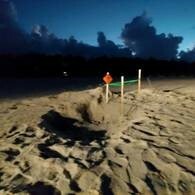 anything that helps clear the way for the nighttime arrival of our sea turtles. The first meeting of the North End SeaTurtle Team (N.E.S.T.) will be on Wednesday, June 20th at 5:30 in the main building of Hilton Head Beach and Tennis Resort, 40 Folly Field Road. Please let me know if you are interested. This is just an exploratory meeting – no obligation, just a fun opportunity to make a difference! Bring a friend! We are up to 28 nests as of this morning – 7 sea turtle mothers nested on Sunday alone! This is a nice rebound from a slow beginning! They worked valiantly in the rain to fill in this one……. Way to go Nina and Ethan!!! 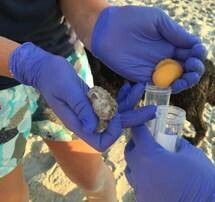 * A message from the Coastal Discovery Museum CEO Rex Garniewicz: We have been in discussions with the South Carolina Department of Natural Resources (SCDNR) this year, because there were several nest-tampering events on Hilton Head Island last year and a few people were seen sitting near nests at night waiting for an emergence. Out of an abundance of caution, SCDNR has asked us not to share the exact locations of nests with our nest adopters and we have agreed that this is the right thing to do. SCDNR has been very supportive of the Adopt-A-Nest program and they know how this educational program helps protect this endangered species, but their ultimate decision is based on what is best for the turtles. 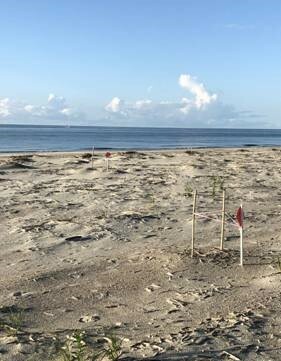 We will still be able to share most information, including the nest number, when it was laid, as well as the results when the baby turtles emerge and head to the sea. We know that you, just like us and SCDNR, want to protect turtles above all else, and we appreciate your understanding that we can no longer give the nest locations out to the general public. So friends, this is where we are – although I can no longer give you details about the exact location of your nest, if there is a specific nest number you would like to adopt, please let me know. I will still keep you up to date on the nests, the sea turtles and the beach in general with current pictures, data and interesting tidbits. So much is going on every day on Hilton Head Island – nature abounds here! 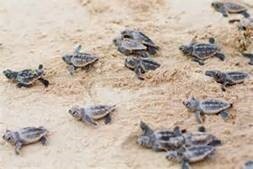 With sincere thanks for your wonderful support and love of the Hilton Head sea turtles!!! 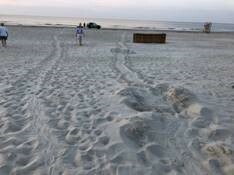 * As of this morning, we have had 8 nests laid on Hilton Head beaches. This is a very small number compared with past years. Last year by May 23rd, we had 40 nests. The two previous years, there were 28 and 35 nests laid by this date. This beginning is unfortunately most like 2014 when we had 5 nests on this date and only 125 nests all season (compared to 300-400 nests in other years). Keeping fingers crossed that our mother sea turtles start coming out in bigger numbers in the weeks ahead! The trained sea turtle patrol gently probes the sand to see if there are any eggs there – a very time consuming task! We have had 6 false crawls so far this season ……. * Exciting time at the Coastal Discovery Museum last night as Mary Alice Monroe, a lowcountry author and champion of the sea turtles, launched her latest book – Beach House Reunion. (Some of you might have seen the movie of her book The Beach House, starring Andie MacDowell, this month on the Hallmark channel.) 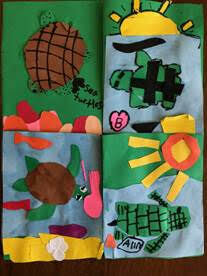 This is a series of books which features sea turtles. Mary Alice is on the Board of the Charleston Aquarium, which has just completed a new state of the art hospital for injured sea turtles. Be sure to visit it when you are in Charleston. Thanks to Mary Alice for spreading the word about saving our environment and making a difference! * And Happy World Turtle Day (National Sea Turtle Day is June 16th but we celebrate anything that helps save the sea turtles!) Tune into Facebook page visithiltonhead at 10:50am Eastern today for some Turtle Talk to celebrate #WorldTurtleDay @visithiltonhead@hhiseaturtle. I’ll be there! 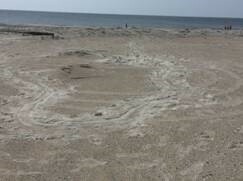 At long last – the first sea turtle nest of the season has appeared on Hilton Head Island! 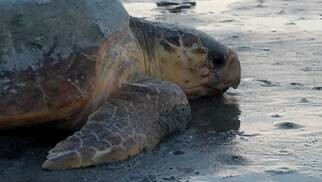 A mother loggerhead sea turtle came ashore yesterday on Folly Field Beach. And a perfect angel of a turtle: notice how nicely she has positioned her nest in front of the dune fences! The unmistakable tracks tell the story – that a mother sea turtle has dragged her huge body up the beach from the ocean to lay her eggs. She finds a good spot, uses her rear flippers to dig a very deep hole, deposits about 100+ ping pong ball sized eggs, laboriously covers them up, then VERY slowly and tiredly crawls back to the ocean. A lot of work for an animal who is not used to being on land! 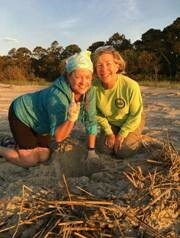 Jayme and Monica of the fantastic all-volunteer Hilton Head Island Sea Turtle Patrol found the first nest and marked it off with three poles, tape and an orange sign indicating that the nest of an endangered species lies below. On the beach, you can help the sea turtles by filling in holes, picking up trash and keeping lights off. If you happen to see a sea turtle, a hatchling or a marked nest, please do not touch: enjoy the sight of nature from a respectful distance. 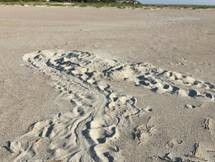 So, we are off – hoping this is the beginning of a season filled with lots of sea turtle nests on Hilton Head Island! The countdown is on until the first mother sea turtle arrives on Hilton Head Island to lay the first nest of the season! We never know exactly when it will happen – last year it was May 4th, the year before it was May 10th. In 2014, the first one did not show up until May 20th. We should have a contest to guess the arrival date! The sea turtles are getting ready: At this moment, courtship and mating of male and female sea turtles is taking place in the ocean. Actually, female sea turtles may mate with several different males just before nesting season. When she finally lays her eggs, they will have been fertilized by a variety of males! The town is also installing sand fencing and planting vegetation to re-establish the dunes that were lost in Hurricane Matthew. 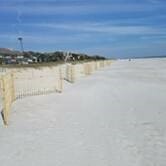 The fencing is specifically designed to be sea turtle-friendly so the mothers and hatchlings can get to and from the dunes during nesting and hatching. We’ll let you know as soon as the first nest appears….! 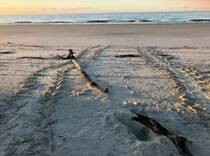 So – the Hilton Head Island Sea Turtle nesting season over. All the remaining nests that survived Irma have hatched, and we are missing our special summer visitors (I mean sea turtles… but also, yes, we miss our tourists as well!). But, please allow me a moment to give thanks to all of YOU – our wonderful nest adopters! You are the ones who are spreading the word, educating people about the endangered species that nest on our island, and helping generations around the world to understand the importance of protecting our environment. Our nest adopters are from 39 different states, and countries as far away as Switzerland and Japan. Adopters like Sabrina in California, who asked her friends to “Be a Sea Turtle’s Super Hero” instead of giving her gifts for her 7th birthday. And Grace who did her 1st Grade poster on sea turtles – she attends a STEM charter school in Verona, near Madison, Wisconsin. And Robbie Bunting and Jane Hyers of Hilton Head Properties Realty and Rentals who adopt a nest for each of their clients. And our many local adopters who patrol Hilton Head Island beaches to fill in holes, pick up trash, and flatten sand sculptures to make our beach safe for sea turtles. And 4th grader Kyle who made his sea turtle presentation to 100 students at his Georgia school. And a girl doing a Peace project for school, who spends time cleaning trash off the beach and rivers, and made a presentation explaining that she does it to save more sea turtles. How about the NYC law firm, Winston and Strawn, who adopted 68 nests! Here is Allan presenting the packet of adoptions to me in Manhattan. And our local elementary school raised the funds to adopt a sea turtle nest for each of 10 classrooms. And there are too many more to mention here…..but on behalf of the Coastal Discovery Museum and the Sea Turtle Protection Project, we thank you so much!!! In February, I will be sending you all the application for 2018 nest adoption. P.S. 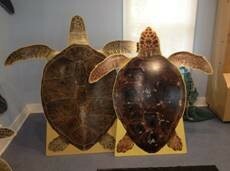 Be sure to visit the museum to see our new sea turtles!!! CSI for Turtles…..that is what two scientists (Dr. Brian Shamblin and Dr. Joe Naim) at the University of Georgia call the DNA work they are doing on our loggerhead sea turtles. They have developed an amazing multi-state research project (the Northern Recovery Unit Loggerhead DNA Project) and for almost 10 years have been gathering important sea turtle data from sea turtle protection projects like ours from Georgia to North Carolina. Here is how it works: our Turtle Patrol takes one egg from every single nest on Hilton Head Island shortly after the nest is laid. The shell is put into one test tube and the yolk into another. The egg shell tells us exactly which female sea turtle laid the nest (the egg shell picks up the mother’s DNA as it is being laid), so we can figure out how many nests a particular mother has laid on Hilton Head Island, and how frequently she nests. The yolk tells what the female ate – so we can tell how healthy she is and where she goes when she is not laying eggs. What I find interesting is where the mother nested every season. For example, we know that the mother turtle identified as Genetic ID CC001226 has been nesting since we started the research….she nested in 2008, 2010, 2012, 2013, 2015, and five nests this year. 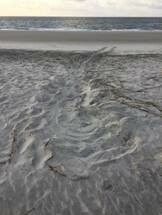 And every single one of her nests was on Hilton Head Island! This is the mother sea turtle who laid Nest # 2, 33, 80, 142 and 205. Other mother turtles are not so faithful – they might nest north of Charleston, then on Hilton Head, down to Cumberland and back up to Isle of Palms! We are learning so much with every passing day! Let me know if you are interested in receiving information about the mother of YOUR adopted nest. If it has completed testing, I will send it to you. Still watching for hatchings on the beach – and grateful that Hurricane Maria did not pay us a visit!!! Your adopted Sea Turtle nest may have hatched – but we don’t know the results! As Hurricane Irma approached, the Turtle Patrol was authorized to inventory all nests that had reached 70 days of incubation to determine how many eggs had been in the nest, how many hatchlings had climbed out, and how many were still in the nest needing help to get out. By the time we returned from the mandatory evacuation, all of the marking poles had been washed away in the storm surge – so we could not locate the nest again. 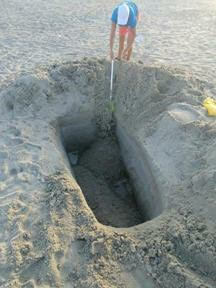 However, the nest was three feet under the sand, and we feel certain that those hatchlings made it out just fine. It is nature – and our sea turtles are strong and resilient. The only down side is that we don’t have the actual numbers of eggs and hatch success for our records. We are still watching the beach for more hatchlings to emerge from the now unmarked nests. Interestingly, those tiny hatchlings have a built in GPS! That is why it is crucial that no one interfere with the hatchlings during their run to the ocean. They must make their own way. It is believed that during this trip across the sand, the magnetic field of the earth imprints on the hatchling’s brains, which give them their sense of direction. In addition to guiding them on their long journey in the ocean (it will take them three days just to reach the gulf stream), this built in GPS will also guide them back to the beach of their birth for nesting in 20-25 years. Amazing creatures! It has been a busy time –nest hatchings are happening very steadily now (several a day) and I want to get your nest result information to you as quickly as possible. We have had 319 nests for the season and 122 nests are remaining to hatch. All nests through #147 have been inventoried. Generally the inventory is done by the team on the third day after the hatch. However, many nests are not inventoried until the 75th day of incubation because we were not able to see the signs of hatching – probably due to rain between patrols. Also, there is little consistency in the length of incubation: Four nests hatched today with all different incubation times from 54 to 60 days. Last week, a nest hatched at 48 days! We are saddened by the hurricane and flooding that has hit Texas recently. 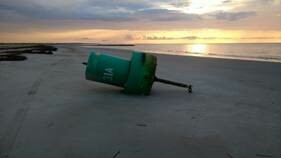 Hilton Head Island’s brush with a hurricane last year is still fresh in our memories. Since our hurricane hit in October, all of our remaining nests were quickly inventoried and closed up. However, at this point in the season, there are still plenty of nests on Texas beaches so it will be interesting to see how they fare. There was another exciting rescue a few weeks ago: A young loggerhead sea turtle was caught by a fisherman in Sea Pines. Since the fishhook was stuck, Amber took him to the Aquarium in Charleston (a fabulous place to visit – they have a wonderful sea turtle hospital there!). The hospital named him Caldwell, did surgery on him to remove the first hook AND an ingested hook, and now he is recovering nicely. Once he is healed, he will be released back into the ocean. Enjoy the end of summer – more updates later! We seemed pretty solid at 315 nests for the year – Nest # 315 was laid on August 6th and we have not had any nestings, false crawls or sightings since then. (You can almost set your calendar on these creatures: last year, the last nest was laid on August 16th; in 2015 it was August 2nd. However, what we do have is a new WILD NEST – sometimes called an undetected nest – that brought us to 316 this week! This nest was not noted at the time of the laying – maybe a heavy rainstorm occurred after the mother was finished – so we had no way to know that a nest had been laid……until yesterday morning when the unmistakable signs of a hatch were spotted by the patrol not far from the Dunes House in Palmetto Dunes! 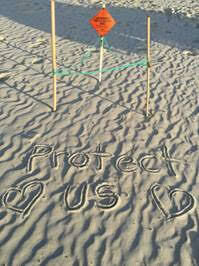 The help of our adopters is so appreciated in spreading the word on the beach about how we can save the sea turtles!!! More later – want to tell you about the sea turtle DNA next time! 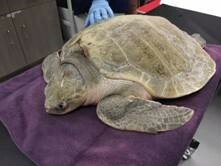 * An injured Kemp’s Ridley sea turtle was discovered during the morning patrol this week. He was taken by our Project Manager, Amber, to the sea turtle hospital at the aquarium in Charleston where it will be treated and released when he recovers. Kemp’s Ridley’s are an extremely rare sea turtle – and are critically endangered. This one had been hit by a boat propeller but we have great hopes for a full recovery for him! Attached is the video of his rescue. many of those need to be relocated (3 just today), false crawls need to be explored (3 of those today as well), green ribbons are being put on all nests of 45+ days of incubation, those nests need to be checked for signs of hatching (31 hatched so far), and then inventories need to be done three days after hatching. This sometimes makes for a LONG morning patrol! Hooray for the team!! 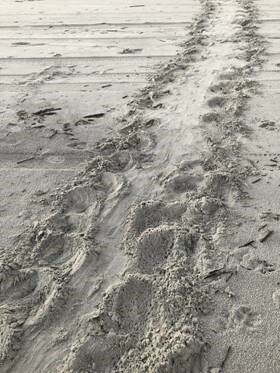 * The tracks left by a sea turtle in a false crawl can be a little bizarre: This mother turtle climbed way over the dune, and the wrack, and all the way up to the renourished beach, did a beautiful Figure Eight in the sand – and left without laying any eggs. Poor tired and confused mother! 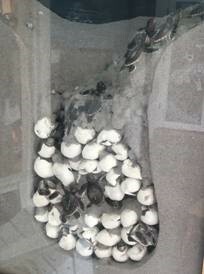 I will try to get hatching results to you as soon as they happen – stay tuned for more news! A happy ending but a good opportunity to remind us to keep our beachfront lights off during sea turtle nesting season….. In the meantime, we are up to 73 nests as of this morning – about the same pace as the last two years. The season is off to a great start! 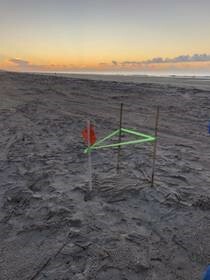 Whoever guessed May 4th for the first Hilton Head Island sea turtle nest would have been correct – today was the day of our first AND second nests of the season! a mother loggerhead sea turtle like this one dragged her huge body ashore in Sea Pines Plantation, spent a long time digging a 3 foot deep hole, and laid her 133 eggs into it, then tiredly made her way back to the ocean. 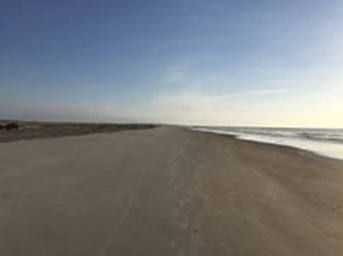 The turtle team marked the nest to alert everyone to the endangered species nest there and continued down the beach, searching for more tracks…..and found a set of tracks in Port Royal Plantation near the Westin – Nest # 2. We are off to a great start!!! 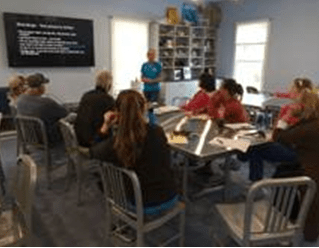 Many more details about the process as we go along – thank you so much for your support of the Hilton Head Sea Turtle Protection Project! We have a fun event for your summer visit to Hilton Head Island. 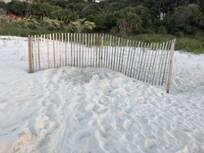 We have adopted four turtle nest, one in Sea Pines, one in Palmetto Dunes, one in Forest Beach and one in Folly Field. 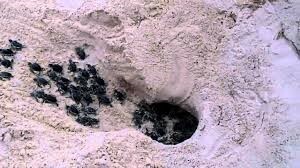 We will send you the Turtle Nest Numbers once the mom’s make their nest. Find one of our nest, take a photo in front (without disturbing it) and send us the photo. Email or text. We will enter you in a monthly drawing for 2 big beach towels. If you would like to adopt your own nest, click here. See below for the 2017 update on the Sea Turtles. 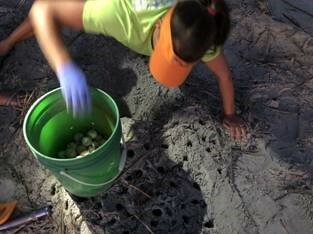 Welcome to the Hilton Head Island Sea Turtle Nest Adoption Program. Although some of you are far away (on other continents!) and some live right here on our island, and some have adopted many times before and some are first timers, we are so grateful to each of you for your support and interest in helping to save the endangered gentle giant sea turtles that nest on our beach every year. We are busy getting prepared for an exciting season ahead and can’t wait to share it with you! 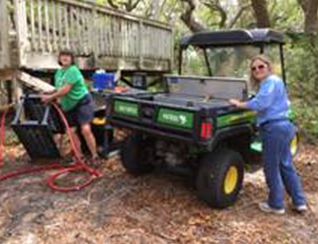 Here are Jayme and Mary cleaning up the “Green Machine”…. – all ready for marking sea turtle nests. 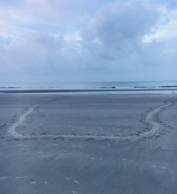 The Beach is ready: Just human and shore bird tracks are visible in the sand as the sun comes up – no sea turtle tracks yet! So, all is set – but when will the first mother sea turtle arrive??? 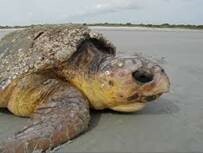 Mother loggerhead sea turtles generally begin nesting on the beaches of Hilton Head Island in mid May. But in case they arrive a little early, our turtle patrol will begin on May 1st. Every morning, rain or shine, starting at 5 am, our stalwart team will scout the entire 13+ miles of beach looking for sea turtle tracks or stranded sea turtles. Last year, the first nest was laid on May 10th; the year before, it was May 5th. In 2014, they arrived on May 20th. Whenever they arrive, we are ready! We’ll let you know as soon as the first nest appears – stay tuned!